PITTSBURGH—A family of molecules developed at Carnegie Mellon University to break down pollutants in water is one step closer to commercial use. Study results published online in the journal Green Chemistry show that the molecules, which are aimed at removing hazardous endocrine disruptors from water sources, aren’t endocrine disruptors themselves as they proved to be non-toxic to developing zebrafish embryos. Created by Carnegie Mellon green chemist Terry Collins, the molecules, called TAML® activators, provide an environmentally friendly method for breaking down toxic compounds that contaminate water, including endocrine disruptors. Endocrine disrupters, which are found in almost 25 percent of our streams, rivers and lakes, can disrupt the normal functions of the endocrine system by mimicking or blocking the activities of hormones in wildlife leading to impaired development. While the connections between the adverse effects of endocrine disrupting water contaminants on aquatic organisms and human health have yet to be established, animal studies suggest that endocrine disruptors may be involved in a host of modern-day health epidemics including cancers, learning disabilities, obesity, and immune and reproductive system disorders. Certain medications are designed to disrupt the endocrine system, such as birth control pills and breast and prostate cancer drugs. In some cases, people taking these drugs excrete a significant amount of the active ingredients into wastewater. Concentrated animal feeding operations also release a multitude of veterinary drugs and artificial and natural hormones into bodies of water. The toxic molecules then contaminate our waterways in part because they are not cleared by conventional wastewater treatment approaches. “Fish in rivers and lakes can be adversely affected by even minute traces of ethinylestradiol, an artificial estrogen found in birth control pills. In what is a worldwide problem, male fish become more feminine, which impairs their ability to reproduce and contributes to declining fish populations,” Collins said. In previous work, Collins and his collaborators showed that TAMLs used with hydrogen peroxide can easily and efficiently remove steroid hormones, including ethinylestradiol, from water after one treatment. In the current study, the research groups of Carnegie Mellon’s Collins and Oregon State University’s Robert L. Tanguay tested several TAML activators to determine whether they exhibit any endocrine disrupting ability. Using zebrafish as a model system, the researchers exposed the fish embryos to seven different types of TAML activators. The embryos used in the study had had their outer membrane, called the chorion, removed to heighten their sensitivity to chemicals. At the concentrations typically used for decontaminating water, none of the TAMLs impaired embryo development. Collins said at higher concentrations three of the TAMLs impaired development, indicating that they should be avoided for use in water treatment. The researchers also looked at the relationship between the chemical structure of the TAML activators and the level of toxicity. 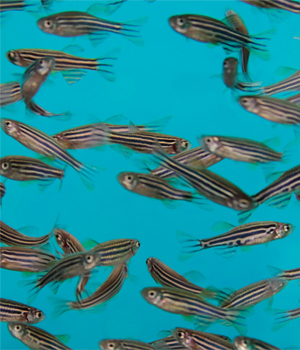 The zebrafish tests represent just one step in a series of tests that can be used to confirm that a TAML activator, or any chemical, is free of endocrine disrupting activity. The test is part of a five-tiered testing system called the Tiered Protocol for Endocrine Disruption (TiPED) that was developed by 24 chemists, biologists and environmental health scientists, including Collins, for chemists and manufacturers to use to determine whether their chemical has endocrine disrupting activity. The tiers range from computer-based approaches and cell assays to tests in fish and mammals. The zebrafish tests constitute tier four of the system. Collins and collaborators in the United States and England have already conducted or are conducting tests on TAMLs using the other assays in TiPED tiers. In all cases thus far, the tests reveal that TAML activators can be designed to not cause developmental disruption in aquatic organisms when used in water treatment. “These collaborative studies collectively provide a model that can be copied time and time again by chemists interested in producing chemicals known to be free of developmental disruption by the highest standards of contemporary science as a way to advance the sustainability of our global civilization,” Collins said. Co-authors on the paper include Lisa Truong and Tanguay at the University of Oregon and CMU Department of Chemistry graduate students Matthew A. DeNardo and Soumen Kundu. The study was funded with support from the Heinz Endowments, the R.K. Mellon Foundation, and the National Institute of Environmental Health Sciences (NIEHS), R01 ES016896, P30 ES000210, P42 ES016465, and F31 ES019445 (based at the University of Oregon). Carnegie Mellon-developed TAML activators have been found to be non-toxic to developing zebrafish embryos. The activators can be used to break down toxic water contaminants including endocrine disruptors. Zebrafish (pictured above) are often used as a model for studying vertebrate development. Image courtesy of Robert Tanguay, Oregon State University.